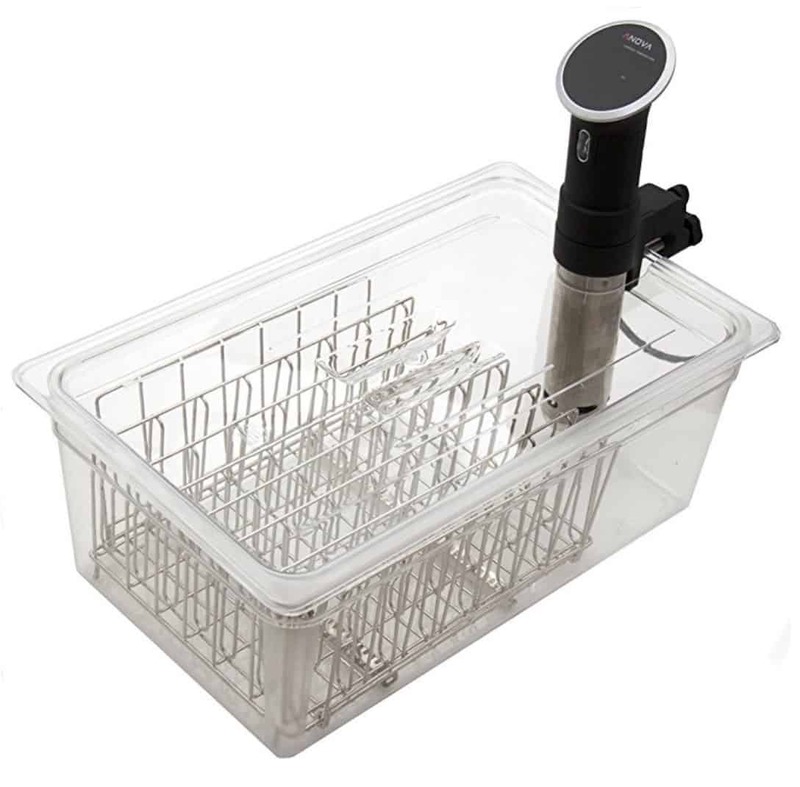 Here are my top three picks for sous vide water bath systems. Two of them are 12 quart systems that work great for small to medium sized families, and one is a 26 Quart system that is best for large families or cooking for parties. My top pick for a home sous vide container system is based on the Rubbermaid 12 quart container. It's a great size for small to medium sized families, and can easily hold 4 to 6 portions of steak, chicken or pork. You may need to cut some larger items like ribs or tenderloins into smaller pieces so they fit in the container, but this is rarely an issue unless presentation is very important to you. The container is made of polycarbonate, which is a staple in the food service industry. It holds in heat better than metal pots and it is designed to hold up to high temperatures. Polycarbonate is also lightweight but strong. The biggest advantage to the Rubbermaid container, and what makes it slightly edge out the LIPAVI system below, is the wide range of 3rd-party accessories you can purchase for it. For instance, I highly recommend you pick up an Everie Sous Vide lid. This helps hold in the heat, making your sous vide machine more efficient. More importantly, it prevents evaporation, which makes handling long cooks a snap, since the water level will never go down. Everie makes lids with cuts for several different circulators. I also recommend getting a rack to go in your container. Many people just get an Ikea Pot Holder rack, which is inexpensive and works well. If you are looking for a more heavy duty solution, the LIPAVI rack also will fit in this container. To help hold the bags down during long cooks or when sous viding vegetables, I turn to these magnets. They work great for fastening the bag underwater, either to the side of the container or to a rack. There is also an insulated sleeve that is designed to work with the Rubbermaid container. It helps keep the heat in and many people prefer the look of it to the clear container. Disclosure: LIPAVI has often advertised on our site, which I try not to let bias my view of them. The following are my own thoughts but I wanted to be clear about our relationship. The LIPAVI 12 Quart container is very similar to the Rubbermaid container, but it is slightly sturdier. LIPAVI sells precut lids for this container as well and they offer their great sous vide rack system. LIPAVI tends to be more expensive than the Rubbermaid system, which is why I have it ranked second. It is a very good system though, and solidly built. It is used in many professional kitchens as well. Disclosure: LIPAVI has often advertised on our site, which I try not to let bias my view of them. The following are my own thoughts but I wanted to be clear about our relationship. If you'd prefer not to go with LIPAVI, Cambro also makes a good 27 quart container but you have to cut the lid yourself. If you have a large family, cook in bulk, or often host parties then you will want to go to a larger size than the 12 quart systems. LIPAVI makes a great 26 quart container that is perfect for large amounts of food. Before I moved to a small New York City apartment I had Rubbermaid and LIPAVI 12 quart systems for my everyday cooking, then this 26 quart system for when I'd host a BBQ or was cooking larger items like a tenderloin roast or several racks of ribs. For most circulators this container is right at the maximum water size, so having a lid is very important. LIPAVI makes a hard plastic lid specifically for this container for the Anova or the Joule circulator. Also, because it is near the maximum volume, when cooking at higher temperatures I also recommend wrapping the sides of the container in kitchen towels to keep more heat in. LIPAVI also sells several sizes of sous vide racks, though they can be expensive so many people just get an Ikea Pot Holder rack, which is inexpensive and works well. I would again suggest grabbing some neodymium magnets to help hold the bags in place. When cooking in bulk there are a lot more bags to manage and you want to ensure that there is enough space between them for proper water circulation.